Yes, you are at the right website! Both The DIGITAL NEGATIVE and The DIGITAL PRINT book’s websites are hosted at this single domain. The book’s actual publication date was supposed to be Aug 2nd. But I’ve been told that people are already reading the Kindle version of the book so I’m trying to catch up with the content–sorry for the delay! Check back over the next couple of weeks as I add the new content about the new book. Excellent news Jeff, glad to hear that the printed version is almost ready too – I’ve had one pre-ordered from Amazon for several months now. I’m looking forward to getting the book and the additional resources you’ll be putting on this site. Can you point me to the location of the Wayne Fox cleaning image that’s mentioned in the bonus content for the Digital Print book. I tried locating it at thedigitalnegativebook.com but couldn’t find it. Thanks for two terrific books. Ansel would have been pleased! ! ! I’ll be posting that image later this week…look for it over the weekend! Just finished reading The Digital Print…. 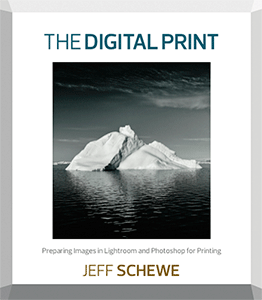 a great book … everything I wanted to know about digital printing and more…. thanks Jeff. Hi Jeff, my copy of the book has arrived and I’m enjoying it very much and finding it very informative. I’ve spotted a small error on p285 in the URL that you give for Clear Bags – the “s” has been missed out and it says “www.clearbag.com” instead of “www.clearbags.com”. Thought you might like to know is case you’re planning a list of such things for this website. I bought both The Digital Negative and The Digital Print just recently. Great books – thank you. Question though: where do I go to download Wayne Fox’s printer cleaning image? your clearing up some old misconceptions I’ve held. Thanks and congratulations on the book. Any new guesstimate on “Wayne Fox cleaning image” release? Thankyou very much for the excellent book, the Digital Print. After reading the Digital Negative, I knew that I would enjoy the next level and it was as I expected. I enjoy that you have been part of the digital transition and that you can compare film to digital technology. For folks of my over 60 age, you put it all into a perspective which is so easy to follow. Thank you. I can’t wait for your next book…The Digital Photographer ?? I’m working my way through The Digital Print and I’m looking forward to using the many new insights I’ve learned to improve my prints from Lightroom. I wonder if you might clear up a question about upsampling? I use an Epson R3000 printer, which, as far as I can tell, does not enable the “Finest Detail”. It appears in the dialog but is always greyed out for all “named” photo papers and is only enabled for the generic “plain papers” option. The question is, when printing with more than 360PPI available on paper like Epson Premium Glossy and Semigloss, does it still make sense to upsample to 720PPI as you suggest, to leave the resolution as-is, or to downsample to 360PPI? I’m enjoying the Print book so much I also picked up The Digital Negative, so I’m looking forward to working through that as well. I am working my way through The Digital Print book & enjoying it very much. Congratulations to the excellent work. Just after a first glance: You describe the Canon iPF 6400 settings in detail. As the Pixma Pro-1 has the same set & type of inks, what would be the main distinctions?